We have purchased the latest machine controlled laser equipment which is instrumental in achieving accurate levels. Extremely useful for commercial construction, large lawns, sports fields and equestrian arenas. Give Roger a call to discuss how this new technology can help you achieve the best possible results for your project. Onsite Development Solutions is a specialist in laser levelling which is beneficial for the accurate level of all types of surfaces. From the laser levelling/blinding of commercial floors, to sports surfaces like tennis courts, bowling greens, multi sports surfaces to equestrian arenas and feed pads. These are also done using the dual grade laser levelling equipment. Onsite Development Solutions have completed many large laser levelling projects with surface areas of 20,000 m2 or more. Onsite Development Solutions have successfully worked on many large commercial and sporting projects throughout New Zealand providing a specialist laser levelling service. Onsite Development Solutions is able to travel nationwide and will endeavour to reach your job destination in the most cost effective manner to enable you to meet your deadlines and budgets. Onsite Development Solutions are specialists in laser levelling/blinding of large commercial floors and large scale outdoor surfaces. Laser levelling is done using a dual grade machine mounted laser control system. 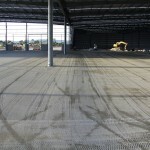 Onsite Development Solutions has an impressive track record of doing the commercial blinding on over 200,000 square metres on post tension floors alone. State of the Art Laser equipment is used by Onsite Development Solutions to achieve the minimum tolerances when preparing surfaces to the exacting levels that you require. The machine controlled drag scoop is used in conjunction with the laser equipment to deliver tolerances to +/- 5mm. This will eliminate re-working to achieve tolerances specified. This is valuable in pre-concrete placement. The benefits of using Onsite Development Solutions for laser levelling are accuracy (meaning accurate concrete pours), consistency and efficiency. We are able to complete the final levels in substantially less time than you would be able to manually, saving you time, labour and machinery costs. This in turn will assist you to meet your completion deadlines and budgets thus avoiding penalties. Tolerances of +/- 5mm are consistently achieved. Planning for an even playing surface is an integral part to your project. Our equipment, laser level and drag scoop, prove to be a real bonus. Whether your field is being sowed in grass or in artificial turf, getting the levels right is an important aspect of the whole project. Numerous schools and sports clubs have seen the benefit of the accurate finish on their sports surfaces as well as the reduction in time to get the job done right the first time. Onsite can excavate, prepare and laser level your tennis court for the surface of your choice. Whether your court is to be concrete, grass or one of the many artificial surfaces available today, Onsite has the experience to help and has worked with many of the major sports turf companies. By using the latest laser levelling technology we can ensure an ideal playing surface ensuring correct falls and drainage to ensure water does not settle in wet weather. By using the laser level and drag scoop the surface of the bowling greens can be prepared to at least within +/- 5 mm tolerance. 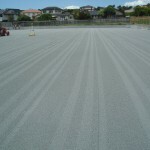 Onsite Development Solutions has had considerable experience working with companies who provide the laying of artificial turf on bowling greens.